Update: The Samsung Galaxy S4 smartphone is launched in India, with the price of Rs. 41500 in the Indian market, and the best Android smartphone right now with some of the best specifications and features which truly are not available in many of the advanced best smartphones from the other brands. The phone would be available on the online stores for the price of Rs. 41500 on stores like Flipkart and the Samsung Indian official eStore. 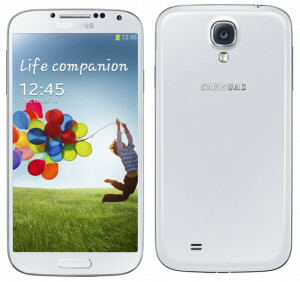 According to the several media sites and blogs reporting today, the Samsung Galaxy S4 smartphone is going to be priced at Rs. 44,999 in the Indian market, and the nation where the Samsung devices are the most sold, it would be available from May 10th, 2013. There is no information available as of now for the other countries and continents like the US, UK, Australia etc. but the price that is now being spread around seems to be reasonable against the rumored price of Rs. 59,990 which was spread with all the criticism on the web and social networks. The date of May 10th for the availability though is quite far and around 2 months before one get a hands-on with what is called the most advanced smartphone right now. As of now, it is said that the Samsung Estore would be the first to list the phone for pre-ordering and sale. The Galaxy S4 was announced a few days back with some of the best features ever seen in the smartphone world, having an octa-core processor but we don’t have the information on which locations would receive the variant with the octa-core processor. There’s Android 4.2.2 operating system, and Samsung has included a lot of excellent features to make the interface user-friendly and more intuitive. The 13-megapixel rear camera of the S4 has got a few features called the Dual-camera mode, Dual Video Call, 12 different shooting modes, Sound & Shot and the Story Album apart from the 1080p Full HD video recording. The S-factor from Samsung has a few additions to what was included in the Samsung Galaxy S3, and a couple of them are Smart Pause and Smart Scroll. We are hoping to see the better of the two processors in the Indian version of the Galaxy S4 – Quad-core 1.6 GHz Cortex-A15 & quad-core 1.2 GHz Cortex-A7. Do check for the updates when the phone is going to be available on the Samsung eStore India. Apart from the device, Samsung came up with a neat list of accessories, and what we were impressed with, was the Health accessories for the Galaxy S4.